This boat is like a sports car. The Ultra-Light 12-foot Vermont Solo Packboat is the newest boat in our fleet. It was introduced in 2013 and has proven to be very popular. The Ultra-Light 12-foot Solo Packboat is made in the same mold as the Vermont Packboat but it uses more Kevlar in the composite construction, which makes it strong and much lighter. We have changed the seat configuration, footrest, trim pattern, and lamination schedule to make a boat that is easily portaged—solo. You’ll find the Solo Packboat is civilized and very agile. It’s light enough for anyone to carry or easily transport. A sailing rig can also be added to this boat. The boat hull is built with a Kevlar composite and trimmed with select cherry wood. 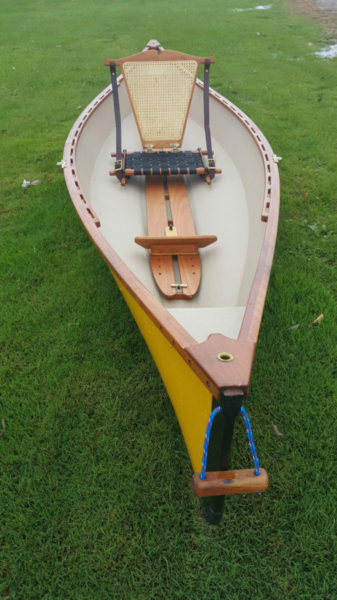 The Solo Packboat includes one cherry seat with nylon black webbing, two maple oars, one adjustable footbrace, Okume floor boards, one set of oarlocks and two Kevlar skid plates.